A few weeks ago the hubby and I went away for Shabbat to a hotel. In a county full of kosher venues, we had our choice of hotels offering Shabbat meals. It makes going away so much easier! When we found out the price for these meals, however, we were kind of turned off. Each meal costed more than the best kosher restaurants in Israel! We decided to dine for Shabbat lunch because it was a long summer day, but not Friday night. So we needed food for one meal. The whole point of going away was to relax and enjoy ourselves, so to start dealing with a hot plate and heating food up didn’t seem appealing. Then I had a great idea! We usually are perfectly fine with soup and challah on Friday night, so why not a cold soup with my yummy challah and call it a day! 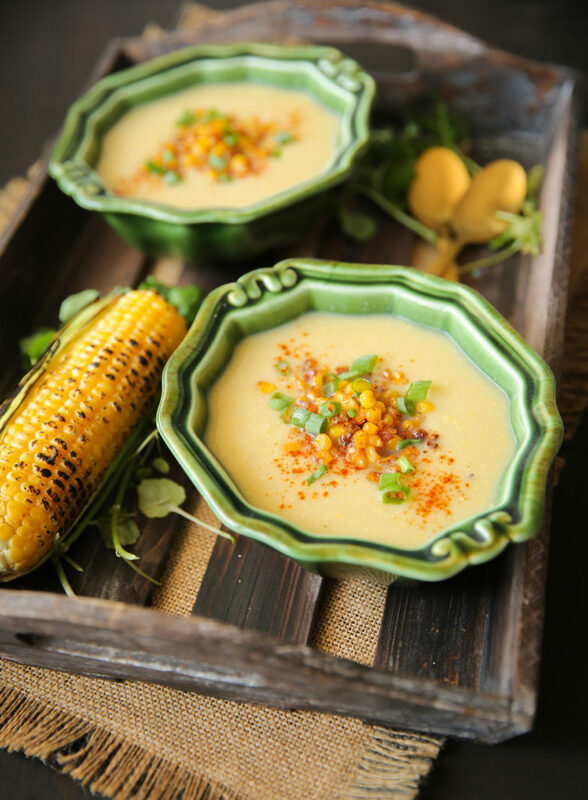 I thought corn — a symbol of summer — would make for a great soup. With summer coming to a close, I wanted to get this soup up for you guys. 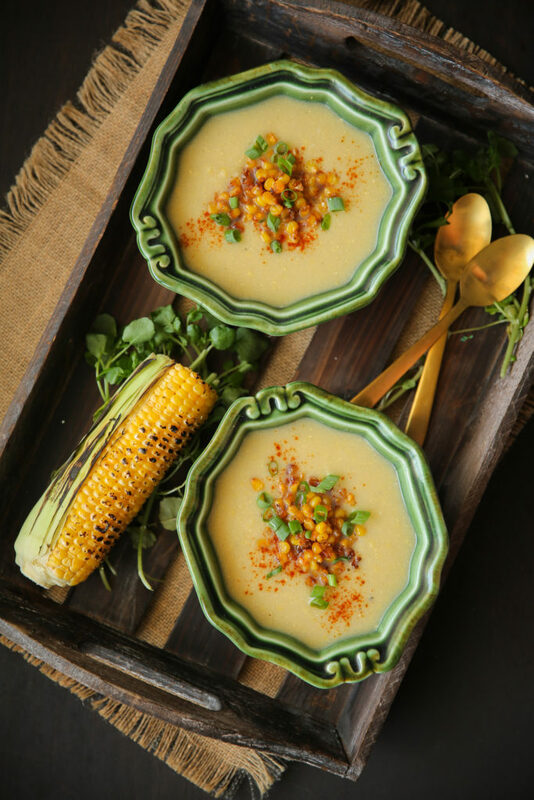 This corn soup is perfect for all the holiday meals coming up since it serves great either hot or cold, and will be the easiest thing you make by far! No need to slave over a soup when you have so many other big ticket items to prepare. With one meal after the other, and with this summer heat, soup courses feel redundant. But with this deliciously cold summer soup, you won’t want to skip the soup course. Cut the kernels off the corn cobs. Place a stock pot over a medium flame, and heat the oil. Add the onions and garlic in and sauté until translucent. Add in the Yukon potatoes, and saute for 2 minutes. Add in the corn cobs (yes that's right, the ones that don’t have any kernels on them anymore), the bay leaf, vegetable stock and the water. Cover and bring to a boil. Lower the flame and simmer for an hour. Remove the cobs and bay leaf, discard them and then add in most of the corn kernels to the soup, reserving some to use as garnish. Simmer the soup for another 20 minutes. Meanwhile mix the remaining kernels with some olive oil, salt, freshly ground pepper and paprika and roast on 400 for 7-10 minutes until crispy, make sure to keep an eye on them because they quickly go from perfection to burnt. Blend the soup to your desired consistency, I prefer mine with some chunks. Season with salt and pepper to taste, but it really doesn't need much. Serve hot or cold! 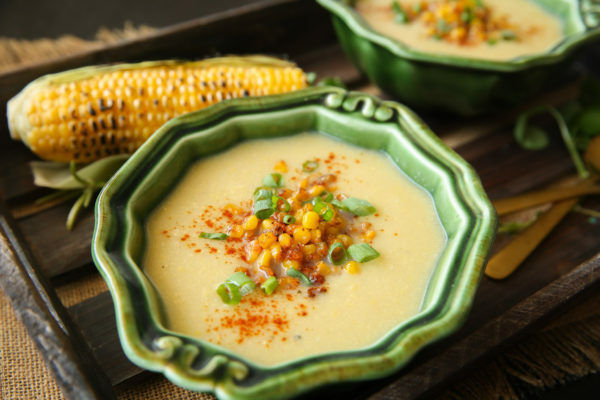 Top the soup with the crunchy corn and sprinkle some extra paprika and chopped scallions.